So you’ve been bitten by the entrepreneurial bug and you’re thinking about starting up a custom T-shirt shop using heat press vinyl. Or maybe you’re already in the sign and graphics business and are interested in expanding to garment decoration using t-shirt vinyl. 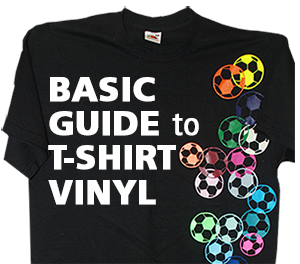 In either case, you’ve probably wondered how the T-shirt vinyl process works and what you need to get started decorating apparel. Wonder no longer. We’re here to give you the scoop. For simplicity’s sake, this article will deal with CAD cuttable T-shirt transfers, otherwise known as “T-shirt vinyl” or “heat press vinyl”. These are the ones you can create with a vinyl cutter. There are digital print options too, including solvent printable films, dye sublimation, and ChromaBlast cotton decoration. But to keep it simple, this article will focus on heat transfer films you can use with your vector software and vinyl cutter. T-shirt Vinyl Hardware: almost the same as for vinyl signmaking. Since both sign making and CAD T-shirt graphics are vector based processes, the essential hardware for making T-shirts is almost the same as that for making vinyl signs. You’ll need a personal computer, a cutting plotter or vinyl cutter, and some vector software. For a detailed list of some options in this area please refer to our Basic Guide to Vinyl Sign Graphics. As an old Haitian friend of mine used to say, “almost chicken is not soup!” Meaning, there is an important difference in the list of essential tools for making T-Shirt graphics. In addition to a vinyl cutting plotter, PC, and software, you’ll also need a heat press. If your production goals are modest, you can begin with a small inexpensive starter press like the EnduraPRESS SA12. If you plan to hit the T-Shirt market like the Allies at Normandy, you’ll need something more robust. For more detailed recommendations on how to choose the right heat press, please refer to our post, How to Choose the Right Heat Press for T-shirt Vinyl. T-shirt Vinyl Software: The same as vinyl signmaking. Design and Cutting. Creating and applying letters on a T-shirt or jersey is almost the same process as making vinyl graphics. Almost. Before you send a design job from your vector software to a vinyl cutter, the file must be reversed so that it’s a mirror image of the original design. (Fig 1). This is because of the way CAD heat transfer film is manufactured. Think of it as upside-down vinyl. When you load the media on your plotter, the liner is facing upward. When you plot the film, you are cutting the bottom of the face film, not the top. Because of this, you’ll have to flip your design before you send it to the plotter. Most t-shirt transfer films have only a single liner, but there are a few that have an additional liner (usually pink) to protect the film during transit. With these products, you have to cut away a section of that extra liner before you begin plotting or cutting the job. Weed it, Flip It, Press it, Peel it. Once you’ve cut your graphic, weed it just as you would normal vinyl. Once it’s weeded, you’ll have the clear liner showing the graphic on the bottom. Place the weeded graphic on the garment on your heat press so that it is now “right reading” (FIG 2). If you’re still looking at a mirror version of the image, it’s upside down and will stick to the heat press instead of the shirt, which will probably ruin your day. Cover the film with a Teflon sheet or silicone Kraft paper to provide even heat distribution and prevent anything from sticking to the platen. Set the press for the recommended time, temperature, and pressure for the material and close it. Once you’re done pressing the film, wait the recommended amount of time and remove the liner. Sell and repeat. Each thermal transfer film has its own recommended time, temperature, and pressure settings. These vital specifications can be found in our catalog or online on the product’s landing page in our shopping cart. For most films, we also offer a PDF document that has all of this information including washing temperature guidelines. In addition to that, we’ve created step by step tutorials for our top-selling EnduraTex films that show this entire process from start to finish. Here’s a link to the HotMark 70 tutorial. So there are lots of ways to get the info you need. Heat Press Vinyl Supplies: Something for every taste. As noted above, there are different types of t-shirt transfer materials available. We now stock over 30 different cuttable heat transfer films hundreds of different colors and patterns. Obviously, a complete examination of all the varieties in the sprawling SignWarehouse…warehouse is beyond the scope of this post. To simplify the choices, let’s group them in the following categories: PU and PVC films, warm and cold peel, special fabrics, and special effects. PU vs. PVC. 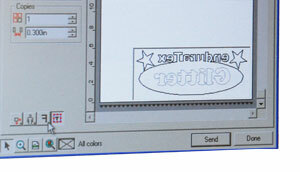 Polyurethane films are the desired medium for t-shirt transfer graphics. These PU products tend to be thinner and more stretchable so they feel like part of the garment. This soft “hand” is what makes them so perfect for apparel graphics. In addition to their softness and conformability, PU films are CPSIA or OekoTex Standard 100 compliant. They’re kid safe. Our CAD-cuttable polyurethane films include Logical Color WarmPEEL Universal, EnduraTex Resolve Plus, Style, Starlight, Chemica HotMark, HotMark Revolution, QuickFlex, Fashion, Galaxy, Siser Easy Weed, Easy Weed Extra, and more. PVC T-shirt films are generally thicker and less expensive. Being thicker means they’re less flexible and don’t quite have as soft a hand as PU. And they’re not considered to be as safe for young children who may mouth the garment and its appliqué. So PVC films should only be used to decorate garments for adult wearers. Our economy CAD-cuttable PVC options include EnduraTex Resolve and Chemica FirstMark. Resolve costs about 30% less than comparable PU-based material which makes it a good solution for your customers with tight budgets. Warm or Cold Peel: The amount of time needed for the adhesive to cure before the liner is removed can be an important factor in productivity. 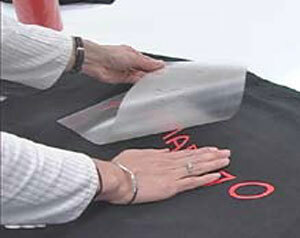 Most traditional heat press films need to cool to room temperature before the liner is removed. This allows the adhesive to fully bond to the fabric. If you’re applying multiple colors, especially in layers, this wait time can be frustrating. For these more complex designs, a warm peel product saves time. Our warm peel transfer films include Logical Color WarmPEEL Universal, Siser Easy Weed, Easy Weed Stretch, Chemica QuickFlex, and HotMark Revolution. HotMark and FirstMark, EnduraTex Resolve and Resolve Plus can be used in a warm peel process as well, but they need 5 – 10 seconds cooling time before removing the liner. So let’s call them warm-ish. Since these products are all designed to be worn, one has to consider whether a particular film is suitable for the intended fabric. This is not a complex as it sounds. With few exceptions, standard PU and PVC films are compatible with cotton, polyester, cotton and polyester blends, and acrylic fabrics. Fortunately, that covers the bulk of what’s sold for casual and sports apparel. However, these films are not suitable for all garments. The time & temperature requirements may damage some fabrics or the adhesive may not hold well. For special fabrics like nylon, leather, and Lycra Spandex, different films are required. We stock Siser Easy Weed Extra for these sensitive applications. If you’d rather not have to stock two different kinds of heat transfer film for different apparel, consider the new one film fits all solutions presented by Logical Color WarmPEEL Universal and Chemica HotMark Revolution. Both films can be applied on a wide variety of fabrics, including Nylon and sublimated polyester. Fig 3: GlitterSOFT offers the look you want with a softer hand. So far all we’ve talked about are standard spot color graphics on garments. These are great for most common applications like softball jerseys. But if you stroll through any department store, you’ll find that there is a huge demand for more eye-catching apparel. Some call it “bling”. We call it a business opportunity. There are lots of heat transfer materials that have extra punch. Use these to add metallic and fluorescent colors, glitter, patterns, or holographic effects to your custom garments. Of all the blingy heat transfer films on the market, the ultra-metallic glitter-flake films seem to be the most appealing. For this market, We stock Logical Color GlitterSOFT, EnduraTex Bling, and Siser Glitter. 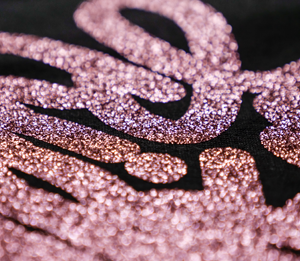 Glitter and Bling are 12mil (350µ) materials with lots of metal flake, so they’re a little harder to cut and weed than a standard T-shirt vinyl. Please review the instructions before you try to create your first glitterized custom T. GlitterSOFT is so named because it gives you all the visual impact of glitter, but on a softer film that’s easier to cut, weed, and wear. For a slightly less metallic effect that’s easier to cut and feels lighter on apparel, try EnduraTex Starlight or Chemica Galaxy. For a super soft chrome effect, try EnduraTex Shine, Chemica Metallic or Siser Easy Weed Electric. Supplemental Supplies: In addition to the hardware and a good line of standard and specialty thermal transfer film, you’ll need a few other supplies. Get a pen and paper handy. Ready? Okay, you need a safety ruler, a Teflon sheet and some weeding tools. And a T-Square It or Logo It will help you get the appliqués on straight. Finally, since all of these films require specific levels of heat, you may need to verify that your heat press is as hot as it thinks it is. For that, you’ll need a handy dandy, Geo Knight IR thermometer kit. This device can save you lots of frustration. Every T-shirt shop should have one. Got it? Good! Now get out there and make some cool shirts!